The Silver Cliff Museum is located at 610 Main St. in the original Silver Cliff Town Hall and Fire House, c1879. Artifacts and memorabilia are from local families, past and present, of Custer County, CO. 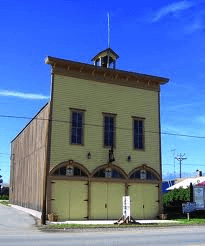 The Silver Cliff Museum, located in the historical Silver Cliff Town Hall and Fire house at 610 Main Street was constructed in 1878 and still stands on the original site. The building was listed on the State Historic Register in 1997. The museum was formed in 1969 by the Silver Cliff Ladies Club, who turned the museum over to the town in 1996. The artifacts and memorabilia housed in the museum include an original hook and ladder, hose carts, various firefighting tools and clothing as well as mining, agricultural, and pioneer artifacts. All items were donated from local residents and families, past and present from Custer County, Colorado. The museum is open from Memorial Day through Labor Day from 1:00 PM ‰ÛÒ 4:00 PM. Off season tours are available by request. Donations are welcome. Call Dorothy Urban, Curator, at 719-371-6679 or the Silver Cliff Town Clerk at 719-783-2615 for more information.